Chinese Rural Development: The Great Transformation. Edited by William L. Parish. Armonk, N.Y.: M. E. Sharpe, 1985. vii, 278 pp. Index. About the Authors. $35 (cloth); $14.95 (paper). - Institutional Reform and Economic Development in the Chinese Countryside. Edited by Keith Griffin. London: MacMillan, 1984. x, 366 pp. Preface. Units of Measurement. Notes on the Contributors. Index. £25 (cloth); £8.95 (paper). - Journey to the Forbidden China. By Stephen W. Mosher. New York: Free Press, 1985. 180 pp. Photographs. $17.95. 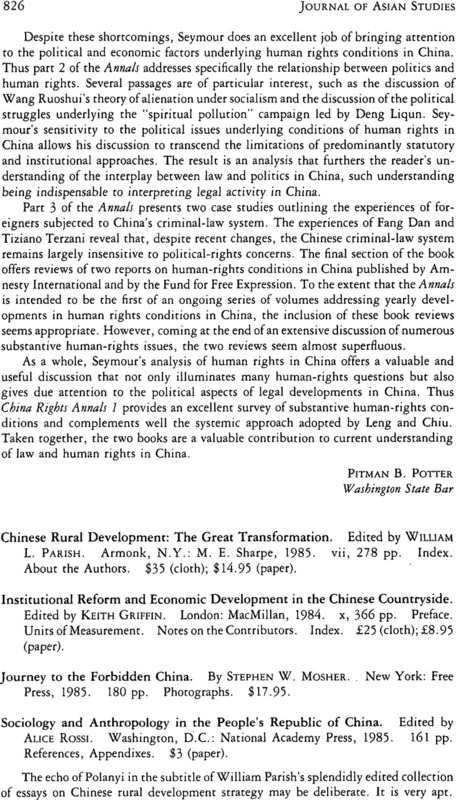 - Sociology and Anthropology in the People's Republic of China. Edited by Alice Rossi. Washington, D.C.: National Academy Press, 1985. 161 pp. References, Appendixes. $3 (paper).